Turn your video into stop motion animation. Easy & fun! “Stop motion” is an animation technique employed in film industry. In stop motion, film frames captured at normal speed are played at slower speed, resulting in interesting intermittent movement of the filmed object. StopMo makes it easy for you: Just load a video file and choose desired visual/sound effects and frame rate. Sit back and watch StopMo animation made in front of your eyes, frame by frame. 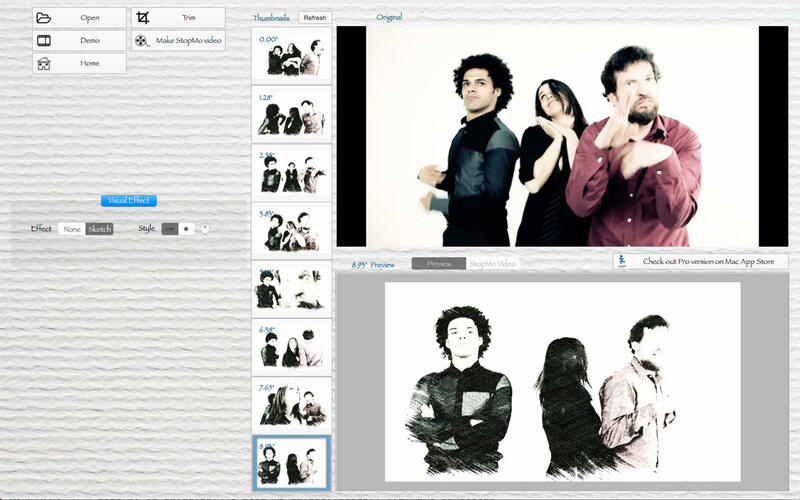 Visit our homepage http://TheApps4U.com/mac.htm to see examples of StopMo video. 1) Supporting various video formats QuickTime Movie (.mov), MPEG-4 (.mp4, .m4v), MPEG-2, MPEG-1, 3GPP, 3GPP2, AVCHD, AVI (Motion JPEG only), DV, etc - basically all formats supported by QuickTime on your computer. 2) Pencil sketch effects using lines or dots. 3) Brightness & vibrance control. 4) Optional notepaper background. 32 papers to choose from. 5) Dozens of music/sound clips to add to StopMo video. Note that StopMo renders video frame by frame and pixel by pixel using a proprietary algorithm which may take quite some time. The actual time depends on hardware specs, frame rate (default = 3 frames/sec), video dimensions/length and selected effects. Please be patient while StopMo is generating the output video. It’ll worth your wait.